I’ve noticed over the past week that the majority aren’t feeling very sisterly when it comes to the red carpet style of Haim. Contrived is a word that has been used most in the comments. But as someone who is all about girl bands having cohesion and presenting unity (which of course comes naturally as they are sisters), I’m a huge fan of their style. They serve up a bit of everything. Downtown cool at the NMEs, boho elegance at The BRITs and here they are paying homage to the ’80s in Versace’s Spring 2018 tribute collection for the Universal Music BRIT Awards After-Party in London on Wednesday (February 21). Este Haim: She wore the striking red look which Margot Robbie made her own. Este merely swapped the sandals for pumps. 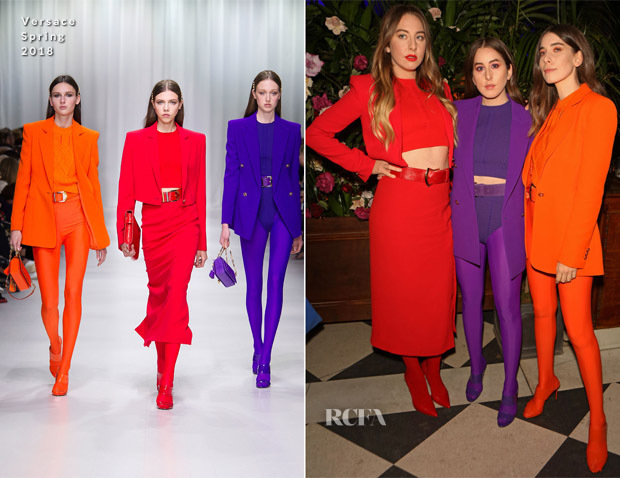 Alana Haim: I have Olivia Newton John’s ‘Let’s Get Physical’ playing in my mind when I see Alana’s monochrome purple look. Danielle Haim: Perhaps my favourite of the three. This citrus look is so uplifting with plenty of attitude. Were these powerful jackets with strong silhouettes, crop tops, leggings and coordinating bottoms a win, win, win in your eyes? I feel like I already know the answer.